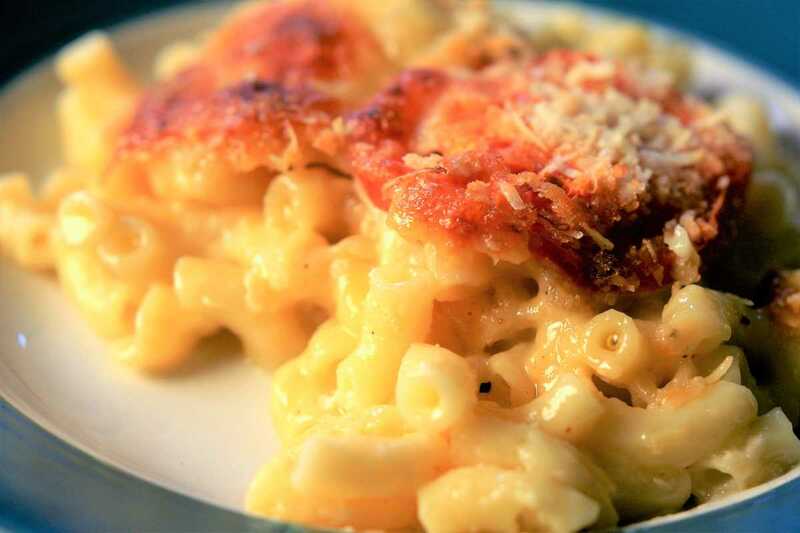 Macaroni cheese is a classic home-made dish for me. It was a firm favourite for us three at home especially for Rob who would devour mountains of it with lashings of tomato ketchup. We were so particular about the consistency of the sauce, being adamant that it had to be “nice and sloppy”. These days I like it a little thicker but still loose enough to be gooey and tempting, and with a nice golden gratin to give contrast in texture. One thing my parents did was to put slices of tomato on the top among the cheese. As a big fan of tomatoes, I would highly advise this. It gives a light freshness to balance the weight of all that cheese. The quality of a macaroni can be judged by the quality of it’s cheese sauce. My Dad taught me how to make perfectly smooth cheese sauce (or white sauce); he told me to add the milk to the roux in stages, and stir thoroughly each time to ensure that its totally smooth before adding more. It’s completely fail-safe and I’ve never made a lumpy cheese sauce since. Thanks Dad! Preheat the oven to 180C. To make the cheese sauce; firstly bring the milk to the boil with the bay leaves, thyme, garlic, nutmeg, peppercorns, cloves and onion. Simmer gently for 20 minutes. Bring a large pan of salted boiling water to the boil and cook 300g of macaroni. Refresh the pasta under cold water once done. Meanwhile make a roux by melting the butter in a saucepan and adding the plain flour. Once combined, strain the flavoured milk and add to the roux in stages. When all the milk is in, add the cheese and double cream. Remove from the heat and stir to combine. Taste and add salt if needed. Mix the pasta and the sauce and pour into a suitably sized baking dish. Now for the gratin; sprinkle the breadcrumbs and finely grated parmesan cheese over the top. Add some slices of tomato, and mozzarella if desired. Place in the oven until lovely and golden on top.